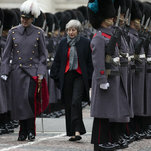 LONDON — Prime Minister Theresa May often puts off critical decisions over Britain’s withdrawal from the European Union, or Brexit, hoping to wear down opponents through doggedness and determination. But her room to maneuver is rapidly shrinking. Twice this week, she has suffered losses in Parliament on amendments, even as she scrambles to limit the scale of a parliamentary defeat of her little-loved Brexit plan that everyone expects next week. One amendment passed by Mrs. May’s critics limits her ability to stall if she loses the vote next week, and requires her to come up with a Plan B within three working parliamentary days of that expected defeat, which would be Monday. The problem is that Mrs. May does not appear to have a Plan B, except to continue to talk to the European Union and hope that she can cajole more lawmakers to support Plan A. Adding to the growing sense of crisis, Mrs. May was defeated over the amendment only after the precedent-smashing decision of the speaker of the House of Commons, John Bercow, to permit a quick vote on it. Brexit-supporting newspapers turned on Mr. Bercow, who they suspect of harboring anti-Brexit sentiments. “Speaker of the Devil” screamed The Sun newspaper’s headline, while The Daily Mail described him as an “egotistical, preening popinjay.” Others complained that he had an anti-Brexit sticker on his car; he shot back that the car was his wife’s. Such is the paralysis that there are calls for the Brexit negotiations to be extended to prevent an economically disastrous exit without an agreement at the end of March — though all 27 other nations would have to agree to prolong the talks, and officials have indicated that they will do that only if Britain has a plan, like a general election or a second referendum. “There has to be a crisis for positions to evolve,” he added. To keep alive any hope of passing her plan, Mrs. May needs to limit the size of any defeat next week, but it is not clear how she can. Concessions that she hoped might calm fears over the so-called backstop plans to keep goods flowing through the Irish border were dismissed as “cosmetic and meaningless,” by Nigel Dodds, the deputy leader of Northern Ireland’s Democratic Unionist Party, whose 10 lawmakers normally support Mrs. May’s government. In desperation, Mrs. May seems to be reaching out to pro-Brexit lawmakers with the opposition Labour Party by dropping hints that the government might accept amendments to her Brexit plan that would protect workers’ rights and the environment. She also made rare calls to two union bosses, though to no avail. And most Labour lawmakers would require a much bigger shift of policy to consider supporting the government, if they are persuadable at all. Another part of her strategy is looking less convincing by the day. Mrs. May argues that her deal, a fuzzy compromise that would maintain some close ties to the European Union, is the only alternative either to an economically catastrophic “cliff edge” rupture, or canceling Brexit altogether. But opponents of leaving without an agreement, the no-deal option, seem to have a good chance of blocking that avenue before the end date on March 29. On Tuesday they showed their strength by defeating the government over an amendment that restricts its ability to spend money on planning for such a departure. Adding to the gloom, Jaguar Land Rover said it would cut 4,500 jobs, as car sales have faltered not just in China, one of its prime markets, but also at home. The company has also complained about uncertainty over Brexit, which could pose a particular threat to automakers because of their complex supply chains. At the same time, support for a second referendum that might scrap Brexit is building, though Mr. Rahman believes that it has yet to gain the support of a majority of lawmakers. In Parliament the mood is ugly, even as it exerts ever greater control over the Brexit process. But if Parliament is taking back control of Brexit, that still raises the question of what it wants to do with it. Though it looks destined to reject Mrs. May’s plan, it has yet to coalesce around an alternative. Jeremy Corbyn, the leader of the opposition Labour Party, in a speech on Thursday repeated his party’s demand for a general election, but he does not seem to have the numbers in Parliament to force one. Mr. Corbyn, a lifelong critic of the European Union, kept open the option of a second Brexit referendum if he fails to defeat the government on a confidence motion soon. But despite support for another plebiscite among his party members, Mr. Corbyn has yet to embrace the idea, either for his own Euroskeptic beliefs or perhaps for fear of antagonizing Leave voters in Labour’s ranks. So could there still be one last escape route for Mrs. May? After next week’s vote, she might have another chance to seek changes to her Brexit plan from the European Union, or, failing that, perhaps make a far more radical change by adopting Labour’s policy of keeping a permanent customs union with the bloc. Though European leaders have expressed reluctance to extend Article 50 because of deadlock in London, Mr. Rahman believes that they might opt for a delay of perhaps three months if the alternative is a disastrous no-deal Brexit.